Jonathan Iloya and Victor Lopes launched the campaign at the Bon Accord Centre, Aberdeen. The disease now kills more people in Scotland than road accidents and the number of cases in the north-east has soared by 80% in the last decade. Health bosses say many of these are due to mouth cancer not being caught early enough and are embarking on a new scheme to teach people about the signs and symptoms. Jonathan Iloya, a consultant in dental public health for NHS Grampian, said: “People should look in their mouths and check for any ulcers or lumps that don’t seem to be healing. Mouth cancer is now more common that cervical cancer in women and testicular cancer in men combined. Last year 358 people died from lip, oral cavity and pharynx cancers in Scotland, including 28 in the NHS Grampian region. 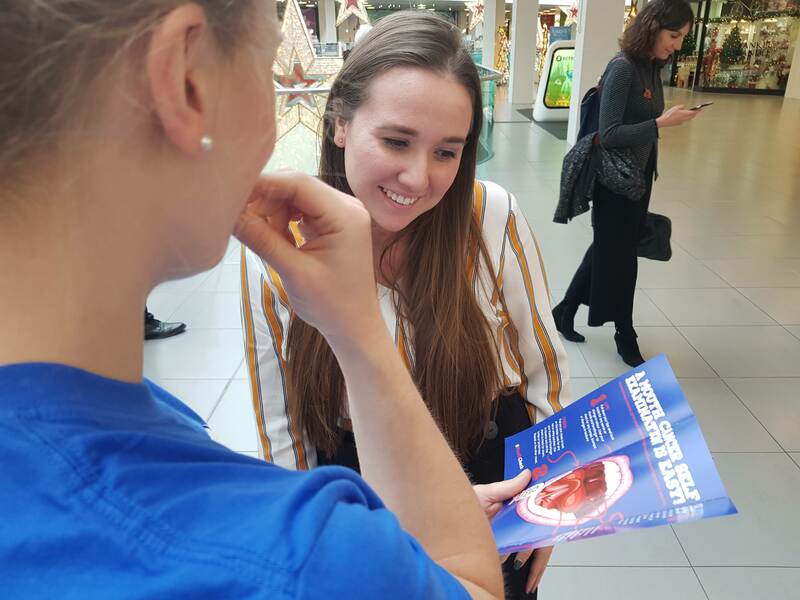 Dental students have been drafted in to teach passers-by how to spot the signs of mouth cancer. 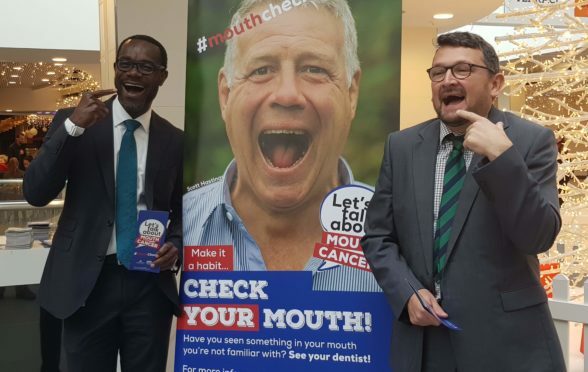 As part of the campaign, members of the public are being urged to look at the factors which can also contribute to mouth cancer. A high alcohol intake and smoking have both been linked to it, as have poor diets and poor oral hygiene. Regular visits to the dentist can also help catch any signs early, yet around half of all Scots have admitted they do not attend regularly. Victor Lopes, policy adviser for charity Let’s Talk About Mouth Cancer, said: “Mouth cancer is still relatively rare. It makes up around 3-4% of all cancers in Scotland so people don’t have the same level of awareness for it as they do others. “We want to give people more control and empowerment to do something about this.